Microsoft has finally lifted the lid on Project Pink - only it's called Kin and the phones will be called Kin One and Kin Two. Robbie Bach, President of Entertainment and Devices Division, unveiled the new phones as devices to help people who need to connect with social media at all times. The interesting thing to note is that these phones aren't going to be obviously-branded as Microsoft, rather relying on the new Kin name. 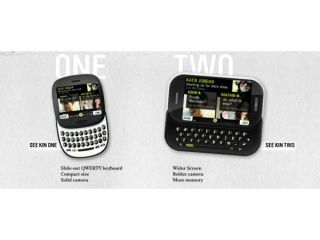 The Kin 1 is a shorter and squatter device with a full QWERTY keyboard that slides out from the bottom, and the Kin 2 is more rectangular with a side-sliding QWERTY. The phones are based on a constantly updated platform called 'The Loop', allowing you to connect to your social networks, messages and pictures and interact with them via one simple interface. The plan is to differentiate different levels of contacts, with those people you actually talk to in real life segregated from general Facebook and Twitter 'friends'. The phones offer advanced hardware, such as pinch-to-zoom and integration of the Zune platform - so this would probably be the Zune phone we've been waiting for so long to see. The Kin 2 shoots in 720p HD along with an 8MP camera, with the Kin 1 coming along with a 5MP effort - and both of them offer a super-bright LED. Vodafone will sell the phone in the UK, with Sharp manufacturing the hardware in the same way as the Microsoft-owned Danger Sidekicks of the past. However, while Verizon will begin stocking the phone in the US from May, the UK will have to wait until Autumn for some reason - perhaps we're not into social networks enough yet or something in Microsoft's eyes.